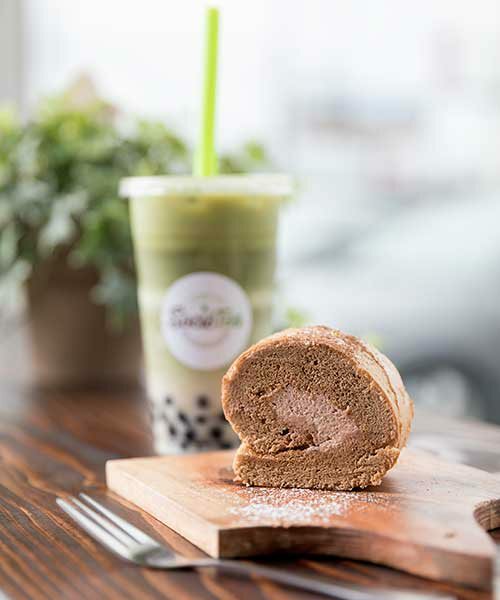 When our former editorial intern Trinh Nguyen popped into my office to sing the praises of SocieTea Bubble Tea, Roll Cake and Much More (1653 E. Sunshine St.), I knew I had to pay the little restaurant a visit. My family absolutely loves bubble tea, the main event at SocieTea. But Trinh told me this new spot does things a little bit differently (think real fruit and less sugar) and even offers a topping that I haven’t seen anywhere else in 417-land: cream cheese. That’s right, cream cheese in a glass of iced tea. Stay with me here! It’s really good! Although I hadn’t found it on a local menu yet, I had been seeing it pop up all over Pinterest and Instagram, in Buzzfeed lists and in all the other places I go to scroll myself to sleep at bedtime and drool over pictures of food I can’t eat. I’d been dying to try it—even though I honestly wasn’t sure I’d like it. I became a quick fan, and for my second visit I brought my husband, Eli, and our two kids along to try it. My 5-year-old son, Oliver, is a big bubble tea fanatic. It’s the treat he asks for almost every time he’s negotiating some sort of bribe. (Mom of the year, over here!) I felt good about taking the kids to SocieTea, though, because they give you the option to adjust how sweet your drink is. 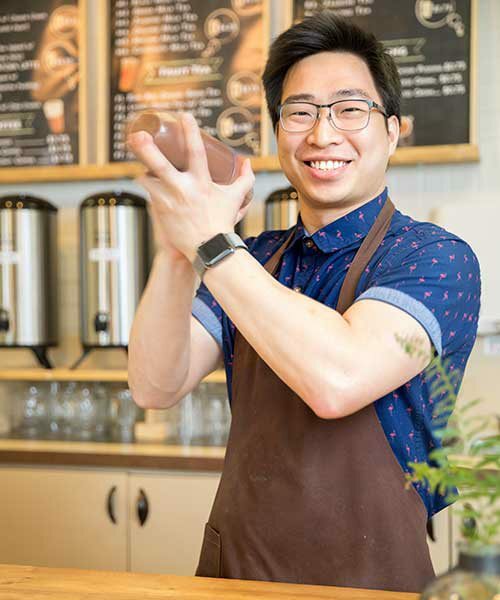 That means my son can order a chocolate milk tea (so he’s happy), and I can ask them to make it with only 50 percent of the sugar (so I’m happy). 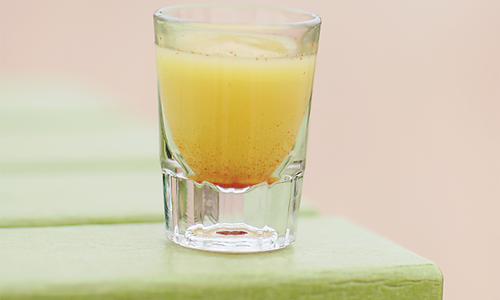 Another perk: Real ingredients. Most of the bubble tea I’ve had has been made with super-sweet flavored powders that are yummy but don’t feel any more nutritious than a bowl of ice cream or piece of candy. 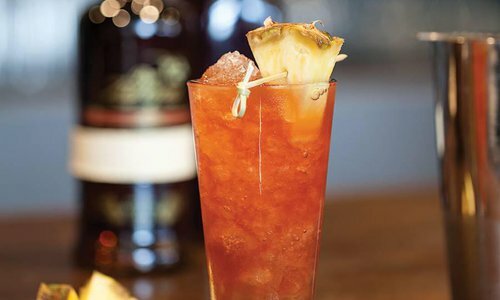 At SocieTea, you can find drinks infused with real, fresh fruit. The flavor is less sweet and more subtle than those bold powdered teas, but they are also a whole lot more refreshing—and, in my opinion, much tastier. 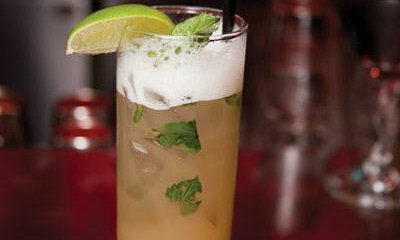 Take for example the apple-honey green tea, served over ice with cubes of fresh green apples. You can still add fun extras like boba and jelly, too. As excited as I was for real fruit tea, we didn’t order them the day I visited with my family. I had a green tea craving, so I went with a matcha milk tea with traditional black boba pearls and a slice of matcha roll cake. If you like green tea lattes from Starbucks, this matcha milk tea isn’t far off in terms of flavor. The boba pearls, however, create a different drinking experience. The roll cake was my favorite taste of the day, though. At first glance, I was afraid the cake might be dry, but it wasn’t. It was the texture of perfect wedding cake, with a strong matcha flavor and the fluffiest filling rolled up inside. I had planned to share this with my family, but… I mostly didn’t. "If you like green tea lattes from Starbucks, this matcha milk tea isn’t far off in terms of flavor. The boba pearls, however, create a different drinking experience." 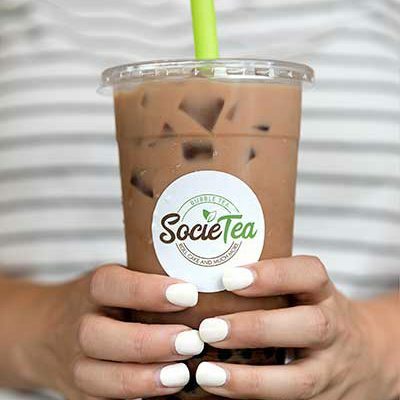 "I felt good about taking the kids to SocieTea, because they give you the option to adjust how sweet your drink is." "At first glance, I was afraid the cake might be dry but... It was the texture of perfect wedding cake, with a strong matcha flavor and the fluffiest filling rolled up inside." My husband, Eli, ordered Thai milk tea but mixed it up by getting coffee jelly instead of boba. If you’ve ever ordered jelly toppings at a boba tea spot, you might have had the tiny, firm little gelatinous rectangles. Those are typical jellies, and they are skinny enough to easily slide up your straw along with your drink. At SocieTea, the jellies look and feel a lot different. They are homemade, not quite as firm (think Jell-O versus Jell-O Jiggler) and absolutely huge! They’re cut into big cubes that break apart as you drink. They are a little tougher to get up the straw, but once they do, they are delish. 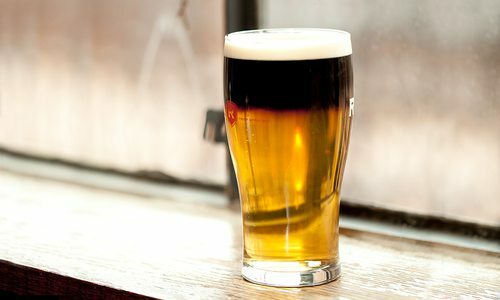 We loved the coffee flavor and the fun texture that they added to the drink. What the heck is bubble tea, anyway? This fun and colorful drink starts with a tea base (sometimes with milk, sometimes without) that’s served on ice or blended into a smoothie. It’s then jazzed up with toppings. What’s the deal with those toppings? The most common toppings are black tapioca pearls. They are flavorless but offer a springy, chewy texture. You can also get flavored jellies (like tiny Jell-O Jigglers) and popping boba that explode with juice when you bite them. 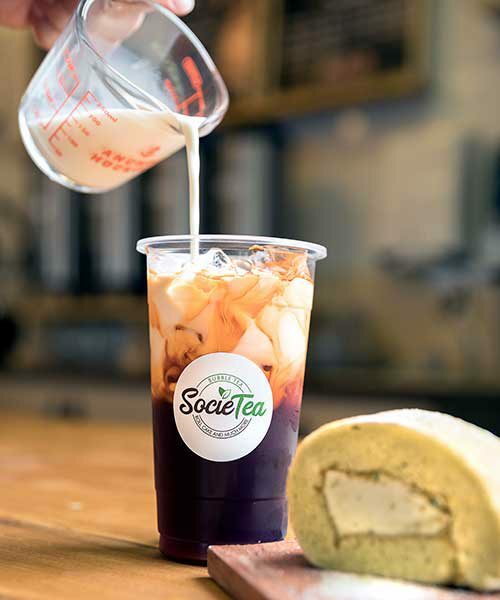 At SocieTea, you can also get salted cream and cream cheese toppings, which are velvety and can seem strange at first sip, but are utterly addictive. The name says “and much more.” What else do they offer? 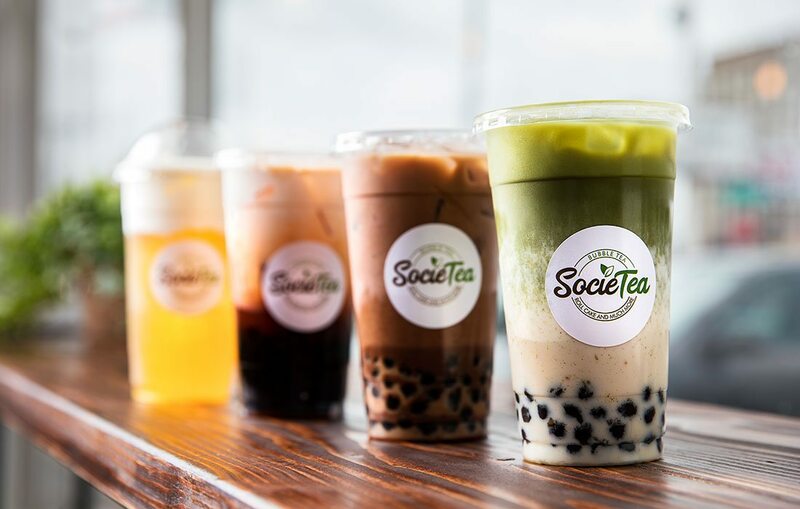 Since SocieTea has opened, we’ve seen a variety of little treats pop up here and there in addition to the roll cakes mentioned in the name. There are fruit teas, of course, but dessert options have included things like little cups of tiramisu and panna cotta.